At the time I decided to switch to a Capsule Wardrobe, I had some frustrating life circumstances. I was still recovering from an ulcer that had resulted in a major weight gain so I was hesitant to invest a ton in clothing that was 2-3 sizes above my norm. I was also hesitant to get rid of things that once I lost weight would work nicely in a capsule wardrobe. And last, but not least, I was working part time and didn’t have a big budget for clothing. I devised a system on how to do this well so read my Step by Step Organization Guide that walks you through best practices when purging clothes—especially if you are in the same boat with not being at your healthy weight. Fast forward to my post-purge moment, I had a much smaller base to focus on for my capsule yet in spite of this, it was still overwhelming! I still had way more items than what is recommended for a Capsule; plus I had a weird mix of black, brown and navy for the Fall/Winter group and a huge gamut of colors for the Spring/Summer. In order to figure out what to do, I went back to Pinterest, viewed the pins I’d saved and searched for Capsule Wardrobe again. Up popped a bunch of photo guides with ideas that were styled well. Yet even with the ones that appealed to me in hand, it was still daunting to narrow down what I had and figure out what I needed. One pin was the key for me: a $22 French Minimalist Fall/Winter eBook from a blog. It and all other links I’m about to give are purely because I enjoy them and think they’ll help you. I’m not sponsored or affiliated with the sites. The stylist, Leanne Blackmon, has written a variety of eBooks and I found it incredibly helpful because she offers links to her suggested clothing items, plus each item had multiple price options (usually mid-level, bargain, and investment level). I personally loved this as it saved me a HUGE amount of time and worth every cent of its cost of the bargain—$22. You can read about her and her service here: Classy Yet Trendy. And check out the different options for Capsules: Year-Round, Seasonal or the newly launched Essential Capsule Closet: Complete Capsule Wardrobe Guide which walks you through creating a completely custom capsule perfect for you. If you’re curious but aren’t sure, get the free Mini-Capsule guide to see what you think. Around a year after I started the capsule way of life, I was gifted a guide with a different stylist, Alison Lumbatis, whose service is focused more on helping you develop the perfect style for you through interactive coaching as well as pre-formatted link-based guides. I’m definitely a fan of her blog and guides too so check out Alison and Get Your Pretty On. She also offers well-priced guides and a free mini-capsule if you scroll to the bottom of her site’s homepage. Choose between seasonal and year-round capsules. Seattle’s varied seasonal climates, as well as my personal base clothing and varied color palates, led me to do two separate capsules: Fall/Winter and Spring/Summer. For those of you that live in a more temperate, year-round climate, it likely would make more sense for you to go with a year-round capsule. Choose between off-the-shelf guides, personal stylists, or a Hybrid; consider time and budget plus how much style guidance you need. Consider if you want to devote multiple days to the transition and do the leg work yourself or try one of the pre-done options and/or hire a personal stylist. I personally strongly recommend the pre-done guides, at least to establish your basic capsule(s). Guides: I thought the guides with links method was a fast, easy, and inexpensive way to get started with a Capsule Wardrobe but there are other options. Both the guides and linked products are quite low cost. I follow both blogs mentioned above, and while these two stylists are just two in a sea of many, I do highly recommend them both. They cater to moms plus offer a variety of price and quality point suggestions. If you take a look and aren’t drawn to one or the other stylist, do a search for Capsule Wardrobe advise (Check google, Pinterest or Instagram) and I’m sure you’ll find someone out there that you do connect with. Hybrid option: Choose an inexpensive guide that captures colors and styles you like, buy some linked items and complete the rest of the items by either self curating or working with a personal stylist. Personal stylists: Available at no cost through your favorite stores or as a paid service with independent consultants that come to your house. Over the years I’ve enjoyed working with the no-fee Nordstrom’s Personal Stylists and I have friends that have used independent stylists that come to your home. Independent stylists are great when you need advise about cultivating or fine tuning a perfect personal style and/or culling your existing wardrobe. Expect fees of around $150 an hour or $300-700 for packages. Many of the home sales clothing companies like Cabi, W by Worth, Etcetera, and LuLaRoe have stylists that would come to your home yet you will feel obligated to buy from them. I know of a few home sales stylists that will help you purge, organize, and advise beyond their brands while charging lower than going hourly rate fee to do so. If you prefer couture or higher end designer items, you can do what I do: combine items from an eBook guide with shopping on my own (or with a local stylist) for unique/high end items which take the place of one of the links given in the capsule eBook. I’m personally a fan of high and low shopping in general, but especially since I’m working towards my ideal healthy physique, I tend to use the links and get lower end bottoms and invest in higher end things that will work regardless of my fitness level. Be sure to do some comparison homework on quality and cost before working with a brand or store-based stylist. Keep in mind that they are commission-based so they may guide you to purchase things beyond your needs. Most work with high integrity so it’s only something to use as a backdrop to their advise. Online stylists don’t make much money even though they give great advise so be kind and use their affiliate links when you buy items they recommend. You are charged the same price either way so pay them back for their research and advise. A few January’s ago, I chose the Fall/Winter French Minimalist Capsule by Classy Yet Trendy which had a color palate of denim, black, camel, white/cream and grey things. Then in March of the same year, I opted for a Spring/Summer collection, also by Classy Yet Trendy, that had a palate of navy and other blues, blush pinks, muted olive, grey and whites. Note: Initially, I stored all Spring/Summer clothing and waiting to fine tune that Capsule. Over the years, I’ve tweaked the 2 Capsules here and there—usually by adding on trend accessories and shoes. About a year ago, I was gifted Alison Lumbatis’s “Closet Staples Wardrobe Builder” which I liked and I added a few items/colors she recommended (like the red tank dress below) but for the most part, I keep the number of items in each capsule small and close to the original group. Early last fall I bought the Classy Yet Trendy guide “Simplified Style: A Year-Round Core Closet Essentials Capsule Wardrobe.” It includes seasonal packing guides to make travel prep incredibly easy and as I’m a chronic over-packer, this was more than worth the cost of the guide. I also replaced some of my worn items with the new items she recommended. Some purists would have gotten rid of anything outside these palates yet I personally think that it’s not smart to remove all color pops or variations. It’s sort of like that crash diet that you can’t sustain in my opinion. Click here for my step-by-step process of purging, organizing and Capsule creation. 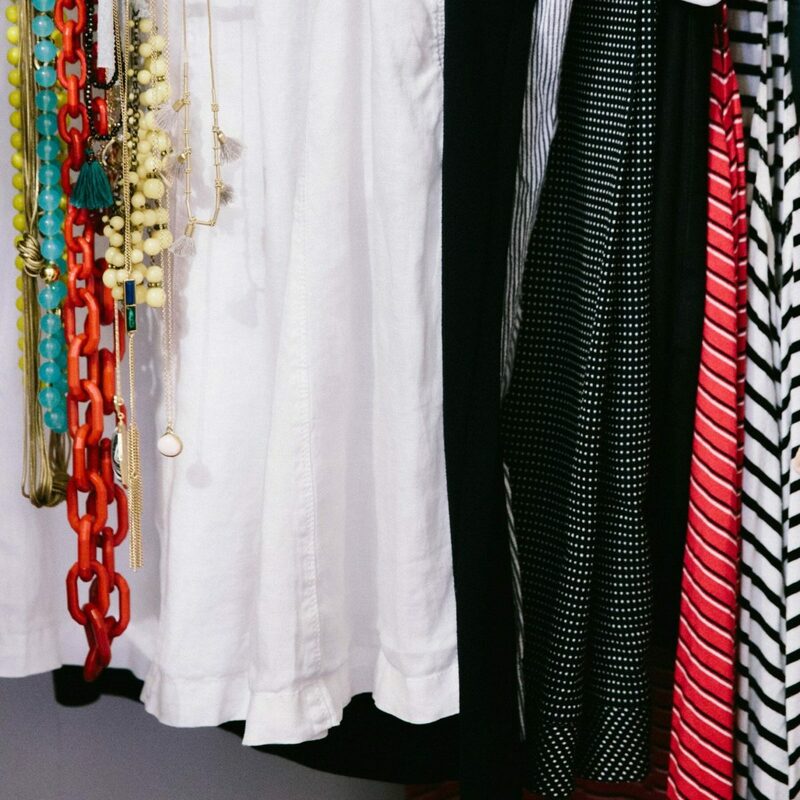 So now you know the what, why, and how behind Capsule Wardrobes. It’s really one of the best things I’ve done for everyday ease and self care! I hope you give it a try and find that it makes your life better too!